“I bought the universal stone yesterday at the Canada Blooms booth in Toronto. I thought at the time “yeah, another miracle product, and obviously was very skeptical that it would work but, thinking of friends who live in Barrie where there is a hard water problem I bought it. My last 800 g paste, I bought in Germany and it lasted so many years, though I’ve been using most of it the last few years – since I have kids (wonder why)! I just ordered some for my friends and family. HIGHLY recommended!! I purchased the universal stone about 2 years ago at the home show in Toronto. 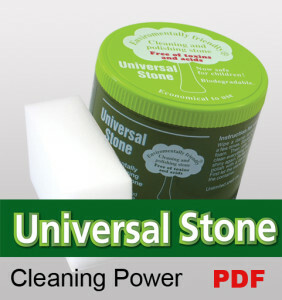 I have used the stone for so many things and it has worked every single time. I originally purchased it to clean my stove top and quickly found other uses for it. My daughter left a crayon in her pocket and I washed a whole load of laundry and also put it in the dryer. Well you can imagine the mess not only was the inside of the dryer covered but also the clothes. I was picking and scraping and getting very frustrated! I used the stone on the inside of the dryer and it worked! Then I thought to myself well I might as well try it on the clothes because they are going to get thrown out because nothing else will work. I scrubbed the spots rinsed them off and put them back in the washing machine (most items were actually jeans) and the crayon was gone. My brother left a tube of polysporin in a pocket of his sweatshirt then the dryer. He had oil spots all over some very expensive clothing, so he brought them to me. I scrubbed (not even hard) each spot and put them in the washing machine then dryer and you could not even tell where they were. I also used it on an old silver tray I did even scrub I applied the stone and wiped it with a cloth – no elbow grease used at all! I just used it again on carpeting my daughter had marker all over her carpet I again used the stone and it worked like magic! Does anyone in my area sell this? I have friends and family that can’t believe what I have used this product on and it has worked and they are interested in purchasing some. I realize that you can purchase it online as well but they would rather buy it direct. We’ve got ‘em! Applicator Sponges, Flat or Foam-filled Pot Scrubbers, Linen Dish Cloths and Ceramic Storage Trays. 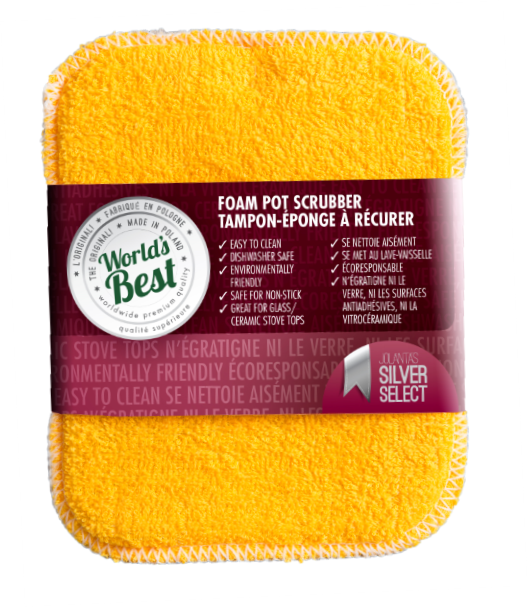 The World’s Best Pot Scrubber – WOW! Streak-Free Cleaning Cloths — We’ve Got ‘em! 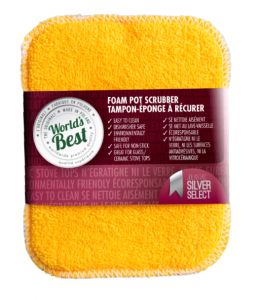 World’s Best Pot Scrubbers: The Amazing Flat or Foam-Filled Scrubbing Pads! The simple green jar with so many uses! A NEW “look” for UNIVERSAL STONE and more for your money too! NOW available at Greenhawk Harness & Equestrian Supplies Stores in Canada!